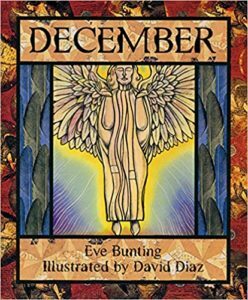 There is a beautiful children’s picture book entitled, December by Eve Bunting and David Diaz. I have used it in conjunction with the Isaiah 64:1, “O, that you would tear open the heavens and come down….” The synopsis is below. A young boy and his mother who are homeless are spending Christmas Eve in a their cardboard box shelter. They have made it as cozy as possible with the picture of an angel with a rose in her hair from an old calendar hanging on one wall. He decided she is named December because that is the word under the picture. They have a little scrap of an evergreen branch as a tree with a paper star and an old tin soldier as ornaments. There is also a paper plate with two Christmas cookies, one red and one green. The boy has recycled bottles and cans for weeks to earn money for the cookies. They go to sleep warm and snug under the great coat of the boy’s deceased father. At midnight they are awakened by a knock on their cardboard door. An old woman, cold and frightened, is asking for help. They invite her in and warm her up. She is so grateful that she takes a faded fabric rose off her hat to add to the Christmas ornaments on the little tree. After a bit of wrestling with his conscience the boy offers her the red Christmas cookie because he thinks she is hungry. They cover her with the father’s coat and all three go back to sleep. Early Christmas morning just before dawn the boy awakens to discover the woman is gone. He is drawn outside of their box and there in the morning fog he sees his Christmas angel, December,….the one on the calendar sheet hanging in the box. She is singing softly and she smiles at him. As she fades into the fog he notices that the rose in her hair is just like the rose that is now hanging on the tree. A year later the boy and his mom celebrate Christmas in their new warm apartment. The mom now has work and the boy is in school. They put out the angel picture and they have a bit bigger tree with the star and the soldier and the rose. There are two cookies under the tree. And even two small presents. They are blessed. Life is very good and the boy gives thanks as he remembers the angel named December.